Weight Loss And Nutrition that Works! Sunday-9-23-12 just for fun I tried on my son’s 30-waist jeans. I was wearing a 40-waist in June, just 3 months ago. What is AdvoCare? Someone like myself may say its something miraculous. But for the uninitiated its a nutrition, energy, and weight loss program and business opportunity that can fill your needs whatever they may be, and help lead you and your family to the one most important goals of all…happiness. I’m still new to experiencing all that is AdvoCare so don’t expect an expert’s opinion on everything you may be curious about. 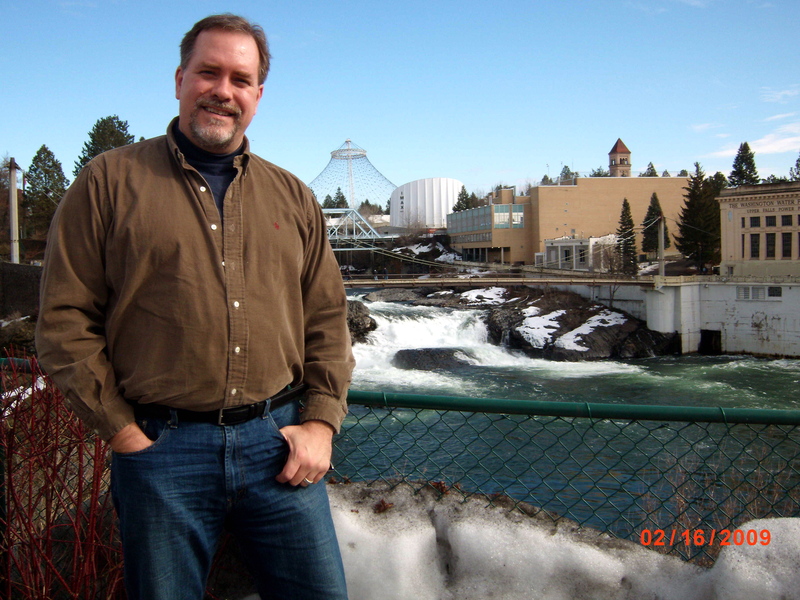 This is just one man’s perspective on what I’ve experienced since diving into this remarkable company. It’s products and diet recommendations have allowed me to lose over 23 pounds net since late June and allowed me to go from a 40 inch waist to 32. My wife, Sonja, has lost even more and is now looking more like the gal I married 25 years ago. I’m so proud of her. It started with me nearly 2 years ago with the death of my Uncle. He died at 61 of a heart attack. Combined with the death of my father in 2001 at age 64 and the death of my Grandfather, their Dad, some years ago at age 65 I was scared of what lay before me. I was 47 and at 245 pounds the heaviest I’d been in my life. And I didn’t like the prospect of dying at such a relatively young age. 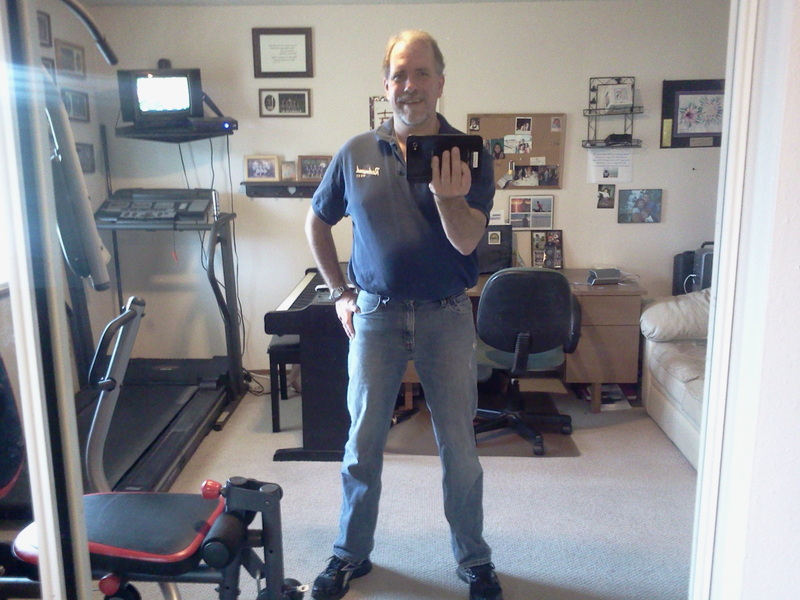 I had been over 230 lbs., and closer to 240, for most of the previous 20 years. It seems silly to write now but prior to my Uncles death I honestly didn’t consider losing weight important. But now I did. I vacillated for months but upon seeing some very unflattering pictures of myself from a family Easter gathering in 2011 I decided to get busy. Have you ever seen unflattering pictures of yourself? If so you know what I mean. 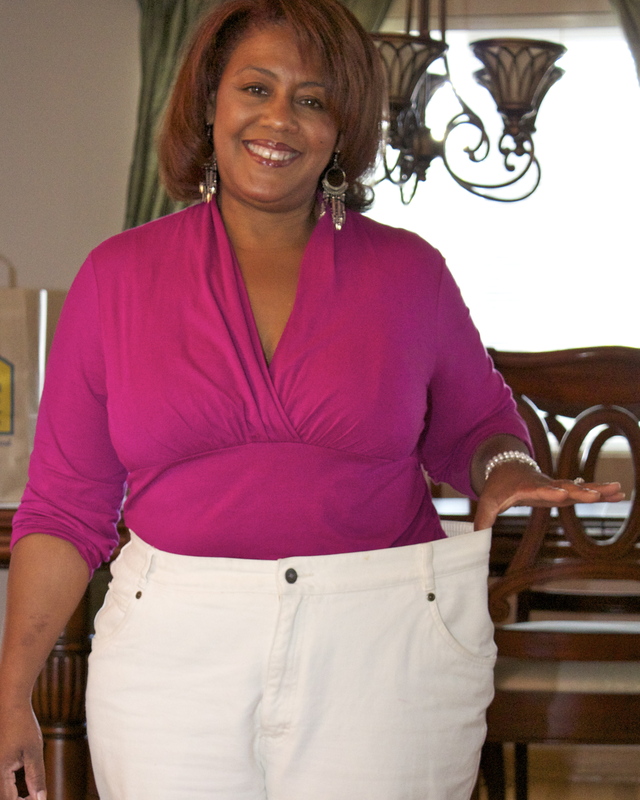 In the 2 months since this “after” picture was taken in July 2012 I’ve lost an additional 10 pounds. I began eating all my meals on salad plates instead of dinner plates to better control my portion size. I’m a big eater and I thought this would be important. I began eating more salads, more leafy vegetables. While I’d been very consistent in exercising for 8-9 years I stepped it up. I even joined my neighborhood gym at the start of 2012. After 10-11 months of this changed behavior I weighed the same as I had when I started. Damn! It was time for something drastic. A friend I’d worked with previously had found great success in health and financial freedom from AdvoCare and had introduced me to AdvoCare‘s 10-Day Cleanse in July 2011. I lost 7 pounds at that time and mistakenly thought I had momentum enough to keep it going. I wonder how many others have made the same mistake; doing something well for a short time…then returning to the same bad habits from before. 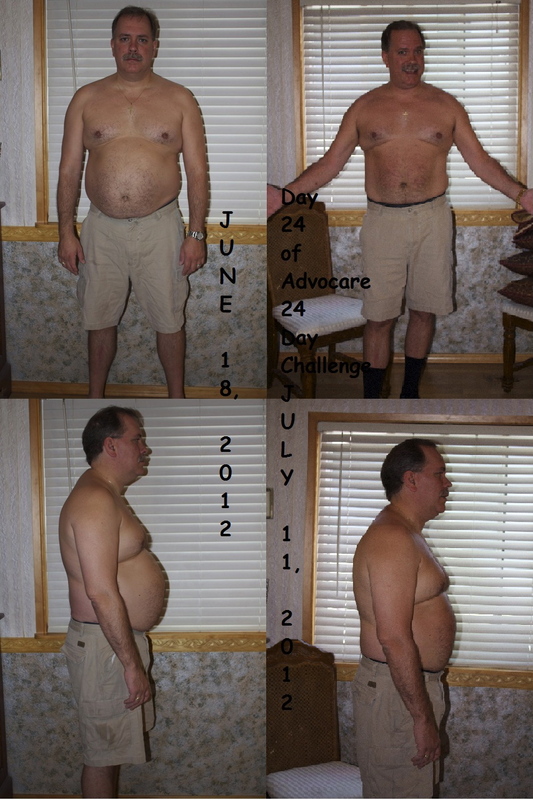 I started the AdvoCare 24 Day Challenge June 18, 2012 along with my wife. It began with the 10 Day Herbal Cleanse that we’d both liked previously. The Herbal Cleanse is a non-eventful fiber and nutritional supplement program that cleans out your digestive track of impurities and long time undigested material. It sets your body up to receive and better absorb the good nutrients and healthy living that is still to come. Spark- their leading selling product. It’s an energy drink loaded with B-Vitamins. And helps you feel great. Meal Replacement Shakes- I just love these. The shakes come in four flavors. Chocolate is my favorite. Unlike many protein shakes AdvoCare Meal Replacement Shakes really taste good. Also, unlike other products, you don’t mix them with milk. Which goes a long way toward making them more effective. And also unlike others I’ve tried, they really leave me full, satisfied, for hours. MNS Max 3- MNS stands for Multinutrient Dietary Supplement. With it you receive a strip of pre-packaged supplements you are to take through the day. Since they’re packaged together in separate packets and easily labelled, it couldn’t be easier. MNS Max 3 provides maximum nutrients, appetite suppressant, sustained energy release, and much more I won’t trouble you with now. Lastly, an optional add-on to the 24 Day Challenge bundle is Catalyst. And Catalyst is the one supplement that is almost magical in what it provides. For me Catalyst just makes me stronger and makes me look so much better. When on Catalyst my workouts are considerably better, and my body is toned in a way I’ve never seen it before. I also received diet suggestions that didn’t have me starving or going through the chore of counting calories, or counting anything. I still enjoy wonder food like tacos, chicken, salmon, trout (which I catch myself) and peanut butter, nuts of all kinds, and almost all kinds of fruits and vegetables. I did not need to spend my time becoming a nutritionist for this to work for me. That was important. I am too busy to bother with examining every littler morsel that goes into my mouth. Besides AdvoCare has a Scientific And Medical Advisory Board of extremely well accomplished physicians and researchers who you know wouldn’t put their names and reputations on the line for supplement products if they weren’t safe and healthy. And professional athletes like AdvoCare national spokesman Drew Brees and Matt Hasselback have tremendous physical requirements for their professions and still use and endorse AdvoCare, and are not paid to do so. 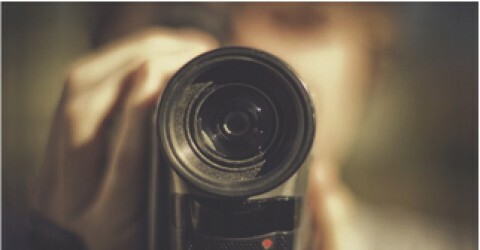 Through all the weight loss my wife and I have maintained high energy which is very important since she works a full-time job and I operate my own video and audio production company, Total Broadcasting Service, while raising our kids. As good as AdvoCare‘s products are I’ve come to believe it’s best product is it’s business opportunity. Yes, AdvoCare is a direct-sales, or multi-level marketing company. But if you let that discourage you from checking it out you really aren’t paying attention. Unlike many direct-sales companies AdvoCare has products people really want, and as a distributor you are not instructed to deceive your way into sales. You aren’t required to buy and stock products. And how many multi-level sales companies work to help their distributors so much by getting its name out before the public by sponsoring numerous major sporting events, like Nascar, the AdvoCare Independence Bowl, FC Dallas soccer, and more. In just the first five weeks of representing AdvoCare as a distributor, while working no more than 10 hours per week above my company work, my wife and I made $500. Do you think you could use an additional $500 per month? How about $1000? How about $20,000 per month. Would that give you some financial freedom like you’ve never experienced before? My friend who got me into AdvoCare has been a distributor for only 3 years. He and his wife make $20,000 per month, and their income is still growing. He and she have left the corporate world where they earned good livings and now work just 25 hours per week helping others grow their AdvoCare business. Can you see yourself leaving a job that you hate, or that you are not well paid, or that takes you away from your family too much in exchange for an income over $240,000 per year while working less than 30 hours per week? That’s the kind of financial freedom I expect for my wife and I through AdvoCare. And early indications are we’re well on our way. You can buy your 24 Day Challenge or any of AdvoCare‘s many health, nutrition and skin-care products at our website: AdvoCare. When you do you can buy the products and remain just a retail customer, or you can spend a mere $79 and become a Distributor allowing you to buy products at discounts of 20%, 25%, 30% or 40%. Now, of course you want good health, and financial freedom sounds good to you too. But naturally you’ll have questions. Guess what. We’re only a phone call away and happy to get you to a point where your questions are all answer and your comfortable making the decision that we made, and that changed our lives. My number is 425-687-0100. I’m Michael. And I’m glad to meet ya.